Hey, I'm just a regular guy who likes to do a bunch of research on the things I buy, and then help people by documenting what I learn on my site. Purchase items from Amazon and others after clicking through my special links below. Toss a couple coins in my hat through a Paypal donation. Link to my pages from your own website, or forums you visit, or inside Amazon reviews, etc. If you reference my site in an Amazon review, be sure to spell my URL as "BriceCenterDotCom" since Amazon doesn't allow external links. Links to my site will help spread the word, and will help my site come up higher in search engines. It does take time to put everything up on this site, and earning a little extra money easily justifies my effort. So, you can help support this site simply by clicking on my special links below before purchasing items. I earn a small commission from these companies for sales made shortly after people click through my links, and it does NOT cost you anything extra. This is also the case for any of the direct product links that I put in my Review and Tutorial pages. These are all companies I use personally very regularly. I'm not just recommending them because of the commission. I literally did ALL of my 2010 Christmas shopping at Amazon, I buy most of my computer equipment from Newegg, and I have 17 Domains registered with MyDomain.com. They are all trustworthy, quality companies. I wouldn't recommend them if they weren't. 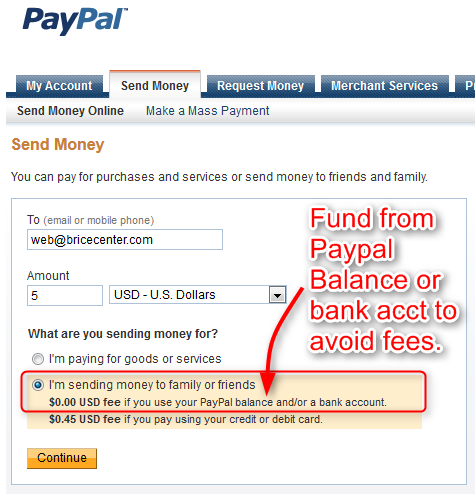 If you have a Paypal account, and don't want to let Paypal keep any of your money as fees, just follow these simple steps to send money fee-free. You can also use this same method to send money to your own friends and family without any fees. Obviously, just replace the email address in step 3. with theirs. Keep this page handy as reference for the future. 1. Click the button above to go to PayPal, and login to your account. 2. Click on the "Send Money" tab. 5. Click the "I'm sending money to family or friends" radio button, and click "Continue." 6. Make sure you fund it from your bank account or PayPal balance for it to be fee-free. If you use your credit card, PayPal will still keep the 2.9% + $0.30 per transaction. If you don't have a PayPal account, you can donate using just your credit card using this button, but PayPal will keep 2.9% + $0.30 per transaction. Just click the button below, and fill out PayPal's donation form.